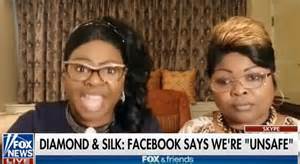 Today, I was watching poor Mark Zuckerberg, CEO of Facebook, testify before congress and I was thinking to myself, “what the hell?”. What was he apologizing for? 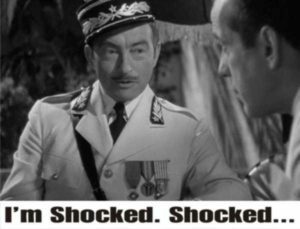 It reminded me of the hypocrisy of Renaut’s declaration in the movie Casablanca: “I am shocked there is gambling going on” right before he is handed his winnings in chips. The problem with this narrative is that is can be challenged on every level. It is well known that all sides have used Facebook ads to influence the electorate for years. It is widely known that there is a end-user license agreement that you agree to when you use Facebook and of course, they sell your information to advertisers. When the problem appeared to be limited to some greater Russian conspiracy, the mainstream media and most Democrats were livid. Now that it involves the UK, Canada, and the Obama campaign, it is unclear how to selectively apply outrage so they call this poor guy to defend himself in front of congress. As the duo correctly analogized, if a Christian baker is compelled to bake a cake for a gay wedding, then the private social media platforms should be compelled to serve everyone equally. Of course, the greater principle of free speech and the right to bear arms is applied selectively. As the Parkland spokes-teen, David Hogg, who proudly owns guns, said in this video, the right to bear arms is like the right to free speech: there are limitations. So the question is should social media platforms be allowed to decide how freedom of speech is allocated? Is a popular social media platform a freeway or a toll road? Is it a public school or Augusta National Golf Club? In the final analysis, these social media behemoth’s want their cake and they want to eat it too. They want to appear to be open and accessible to all yet reserve the right to censor content according to their moral compasses. Fair enough. But what I really don’t understand is the moral outrage. Instead of being angry about freedom of speech, fair elections, and lack of privacy, people appear to be looking for someone to blame for an unpopular president being elected. It is hard to understand the world that main stream media people live in. 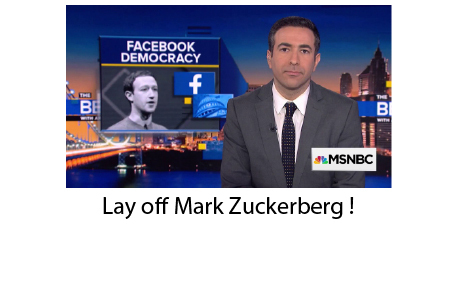 Zuckerberg is not blameless but he can’t be held responsible for Trump being elected. Are people really unaware that they are constantly being surveilled? Your location, your conversations and communications, your relationships, your purchases, and everything else is always being recorded. This is not a conspiracy theory; it is fact. Clearly, the educational system is not doing enough to teach “1984” and the Bill of Rights. But let’s say that a political party wanted to label certain people as enemies of the state and then in four years, the opposing party wanted to do the same. Even the president’s lawyer had his offices raided by the FBI yesterday. Try Googling J Edgar Hoover and you will see how easy it is to maintain power with blackmail. Do you think that this blog is a bit extreme? I have bad news for you: the “thought police” are already spending your tax dollars building a case against anyone with an opinion and platform (see the Chicago Sun Times article below). You may not have a problem with rounding up political gypsies and Bolsheviks for now, but if and when the tools fall into other hands, what other groups will be deemed “enemies of the state” when the pendulum swings? There is a reason the founders created a Bill of Rights and it wasn’t because they trusted big government and corporations. The greatest technological advancement since the Bill of Rights isn’t the AR-15; it is the ability to do illegal search and restrict free speech that has been engendered by social media/intelligence cooperation that we allow to happen. If you object, don’t use social media and use an old flip phone. You don’t have to act out like the YouTube shooter. But if you think the use of mobile phones, the internet, and social media are tantamount to the pursuit of happiness and are therefore necessities of modern living, then you may want to advocate for a broader interpretation of corporate accountability going forward.